Heres a little side note too. If you see a complete pipe tomahawk in good condition auction off for $1000 or less there is something seriously wrong with it. They average more than 3 times that price & as high as $90,000 and yes, collectors are watching for authentic ones every minute of every single day. That great deal you thought you got is likely not. Below here is a reproduction cast pipe tomahawk head sold by a number of online retailers that someone added an inlay to and a curly maple handle. Actually a very nice piece if it is sold as a repro, but unfortunately it was sold as authentic. The steel was 'aged' in the classic pattern that acid etching causes. This style has been commonly used in reproductions. There was even one for sale in a popular Sante Fe Gallery that has been known by dealers to flirt with fakes but not by their clientele. They wanted over $19,000 for it. I've never seen one single example of this exact pattern among authentic tomahawks. 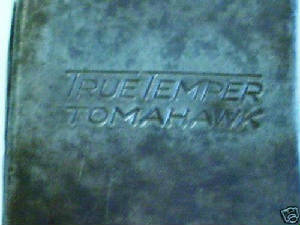 Here is another cast pipe tomahawk repro with some filing added to it. Can you see the black paint flaking of it? The Ohio auction house that sold it is now trying to sell it again as early 19th C. after their last bidder returned it. 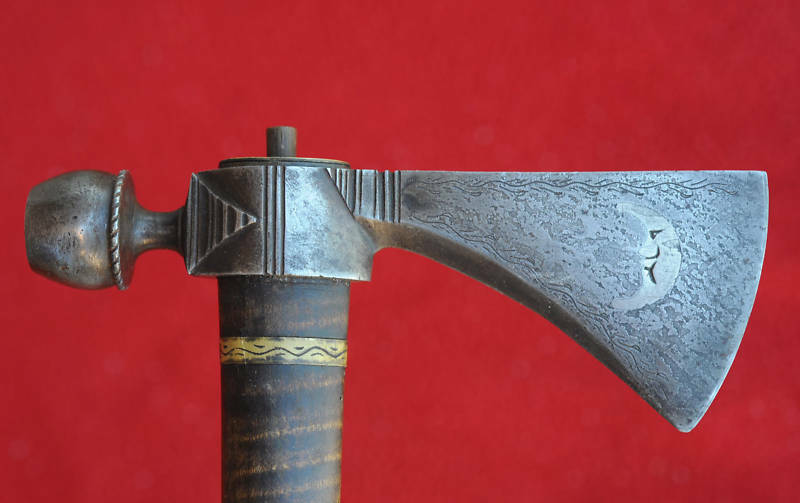 This Missouri War Axe has excessive hammering marks on the face of it. 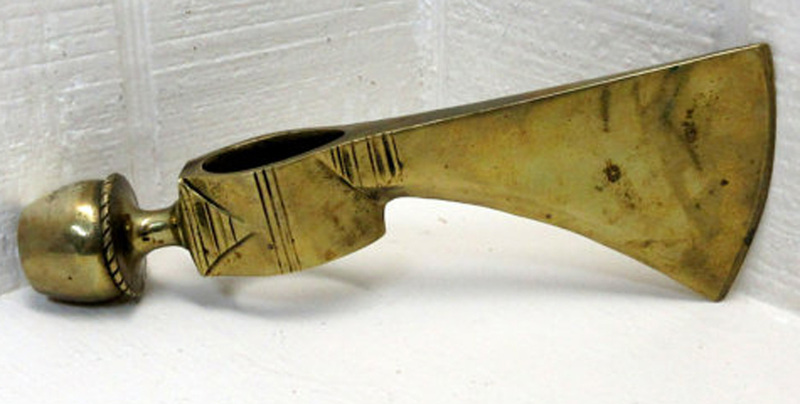 The makers of reproductions often want to show obvious evidence like this of it being hand forged whereas the original ones were mostly flattened and filed smooth. The fur trade period blacksmiths were more concerned with showing off their skill, not proving that it was hand forged. Everyone back then already knew they were all hand forged! 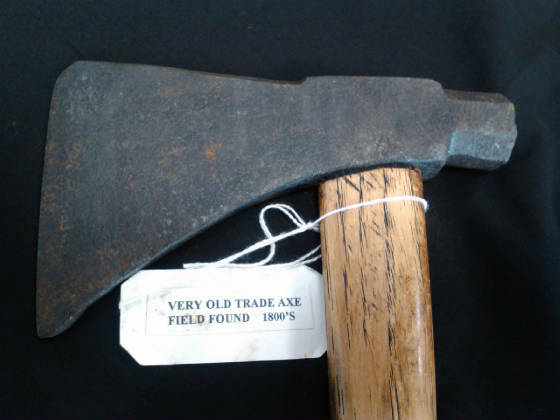 The American made axes occasionally tended to be a little more rough in some instances, but that was because they were often working on the frontier with what they could scrounge & didn't have the large assortment of tools that a Sheffield blacksmith had. But even they tried their best to make them smooth. This particular reproduction was made by Beaver Bills Forge and has his beaver mark on the back although occasionally they show up on ebay as authentic. BTW, the maker once told me he was approached by someone who wanted to buy his axes in quantity except without his mark on it. To his eternal credit he refused. Obviously they wanted unmarked hand forged examples to sell as originals. 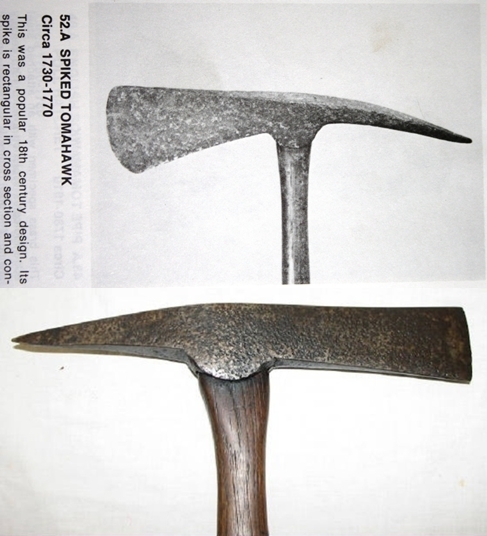 This spike axe made & marked by Underhill Edged Tool Company has been thought by some to be a tomahawk because their trade catalog for wholesalers identifies it as the 'Tomahawk Pattern'. Then it must be a tomahawk, right? It certainly fits one of the common patterns of such weapons. The Underhill Edged Tool Co. began in 1852 in Nashua, N.H. and the catalog is dated 1858 so the time period also fits although at the tail end of it. 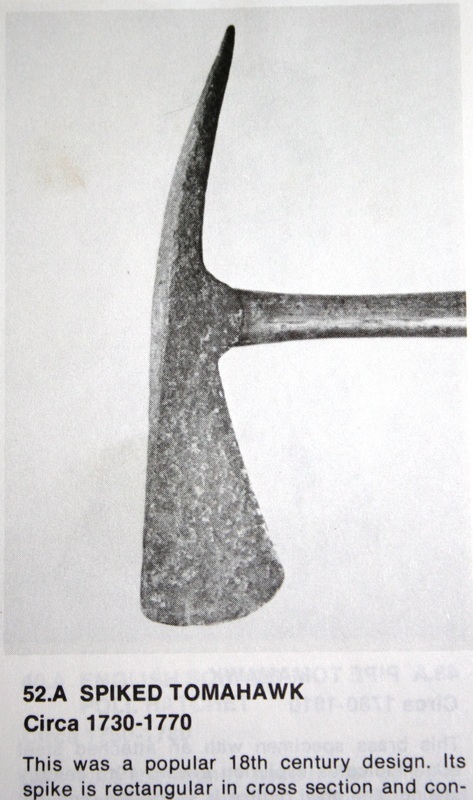 In 1879, Underhill acquired the Amoskeag Ax Company which was the successor to the Blodgett Edge Tool Co. & the exact same pattern spiked axe as Underhill's is found with the Blodgett Edge Tool Co. name on it. However the key word to pay attention to here is 'Pattern'. Axe pattern names were picked by rather unscientific means --sometimes based on what regional people may have begun calling it where it originated or just an advertsing ploy by the company. 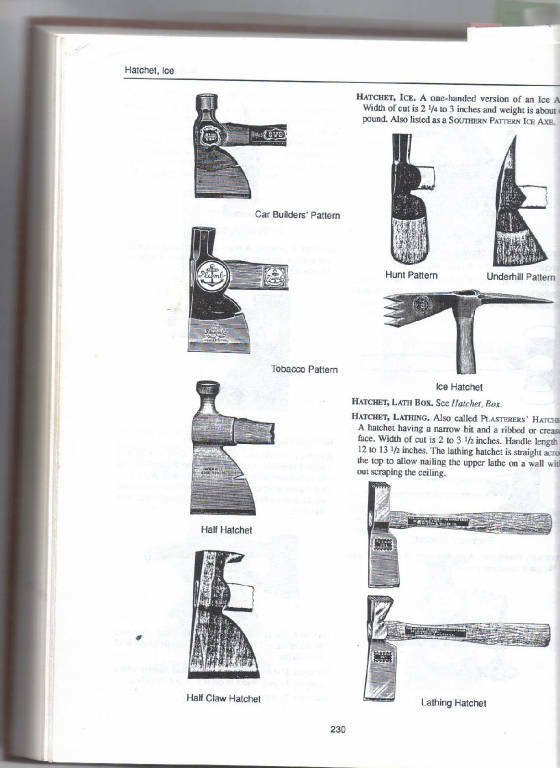 For example, on the same page of this catalog the 'New Orleans Pattern' is also shown as a broad axe type however the New Orleans pattern axes were sold for many years in the 19th C. all over the U.S. & internationally, not just in New Orleans. So to assume that the 'Tomahawk Pattern' axe's intended use was as a weapon instead of as an ice hatchet, as it was later published as, is in serious doubt. More likely it was a marketing ploy to the public, which was devouring with great relish at this time the stories of the West and Indians. Other examples of pattern names in this same 1859 catalog include the Kentucky Pattern, Georgia Pattern , Honduras Pattern, Kent Pattern, Boy's Pattern, Pittsburgh Pattern and an Ohio Pork Axe Pattern--no kidding! 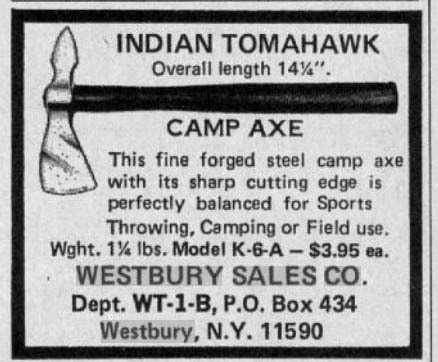 A number of common hatchets being sold today are still advertised using the word tomahawk in it's name such as welding picks or tomahawk crate openers or True Temper's Tommy Axe, the list goes on. So just because it is identified by the manufacturer as a 'tomahawk' does not mean it was necessarily used as the original frontier weapon. The wholesale catalog in question was given to hardware dealers who are thinking of buying their items to sell to their patrons. Tool collectors are very familiar with these types of catalogs which have been reprinted in recent years. Indians did not frequent hardware stores to buy their tomahawks. They were traded by frontier traders, blacksmiths or by the government of a country to the Indians or to each other. Thats about it. I have seen a number of these heads painted with red enamel paint, which indicate use as a fire hatchet since that is the standard safety color used on them for easy recognition & visibility. 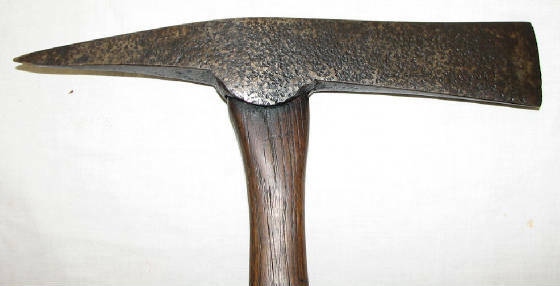 Is it possible it could have been used as a tomahawk in 1859 and then changed to an ice hatchet after that? Maybe. But how would you know? They were constructed the same throughout the company's history and the succeeding AATC history with the same Underhill markings until it closed in 1921. 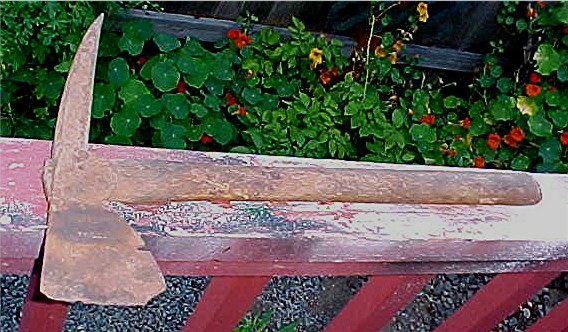 Patina alone will not distinguish whether an axe was made in 1859 or 1890 or whether it was used as a weapon or a tool. Even a shingling hatchet could have been used by American Indians, but I wouldn't point to all shingling hatchets as tomahawks because of it. Also the number of photos of Indians holding spike tomahawks is almost non-existent. By the 1850's very few Western Indians were using them & the reservation era was already well underway. 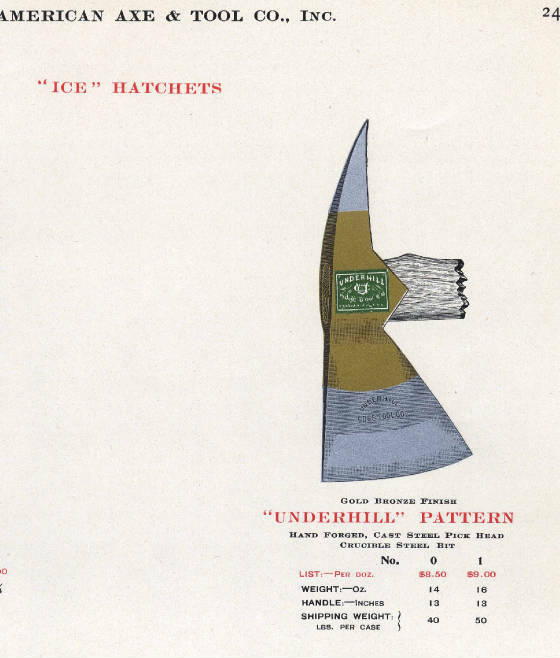 In the book "A Dictionary of American Hand Tools, A Pictoral Synopsis" by Alvens Sellens, 1990; the exact same pattern from Underhill is called an 'Ice Hatchet'. Sellens sources were also from the old sales catalogs of these various companies over the years. Excerpts from hardware trade catalogs. NOT REALLY A TOMAHAWK BUT HEY, IT SELLS. 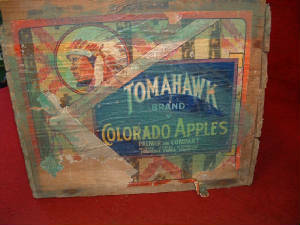 Old crate- these aren't weaponized apples, honest! ITS CALLED MARKETING. 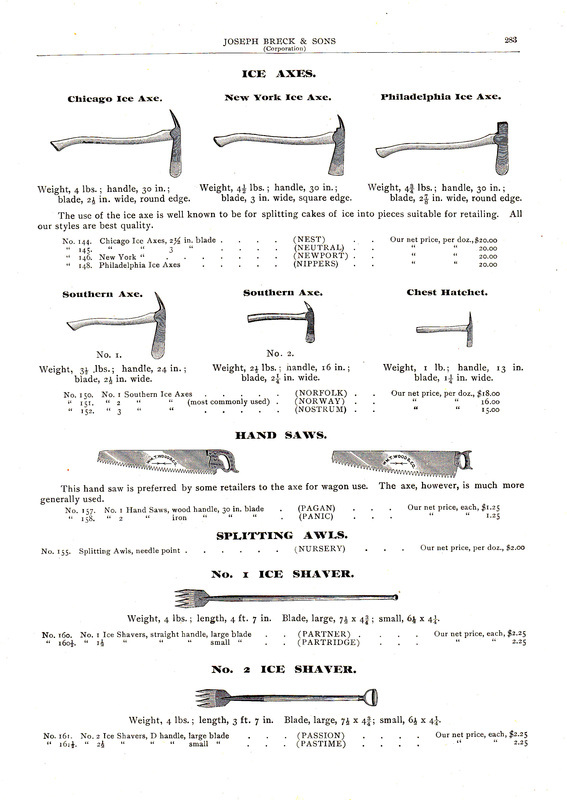 The image below was taken from a reprint of the 1894 American Axe & Tool Company catalog which had bought out the Underhill E. T. C. in 1890 along with 14 other axe companies. 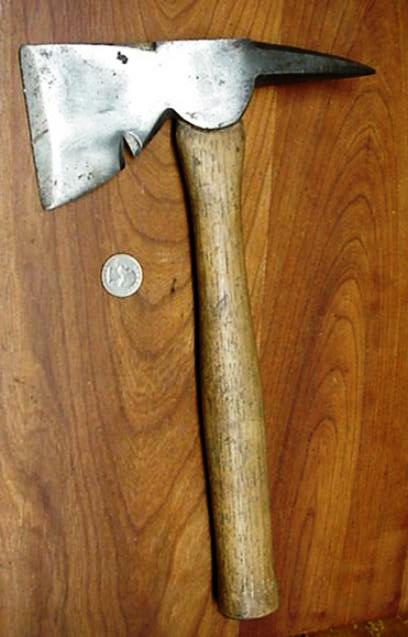 The American Axe & Tool Company continued to use the Underhill name and patterns but closed down the Underhill plant. It is doubtful Indians ever bought their spike tomahawks in the local hardware stores yet this myth persists in book after book. 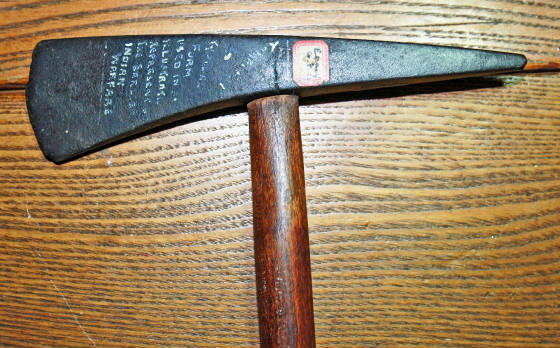 Although the evidence is clear this axe was designed for ice and not Indians I'm sure some will continue to argue the use had changed over time & so the pattern name changed. Denial & self justification are all too common among collectors when money & pride intersect. Soon nearly any old hatchet looks like a potential authentic tomahawk. 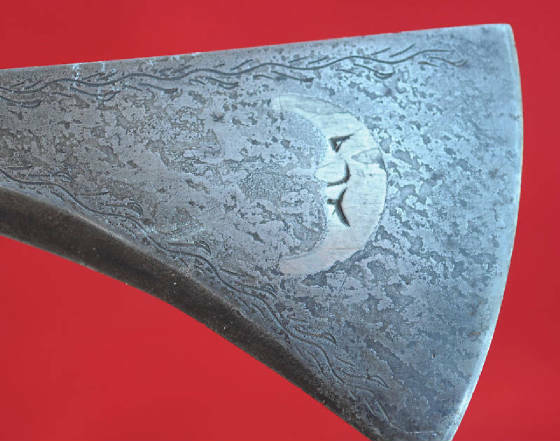 Here is an authentic looking forged trade axe head on a faked haft. The seller claimed the axe & haft were original to 1776 but you can see the brightly colored unstained wood in the eye where the staining rag couldn't quite reach. Also the haft is not shaped or wedged to fit the eye at all & the head came from a reproduction maker. Authentic hafts from the period can multiple values many times so this is a common way for sellers to make up a good story & quickly magnify their profit. Someone later tipped off the faker and he redyed this one and it quickly sold, selling more of them on ebay with elaborate self documented stories such as from Skene Foundry or Maurice Foundry complete with faked documentation & an elaborate story prepared by the seller. Foundries never made tomahawks. They made the raw iron bars for the blacksmiths to use elsewhere. 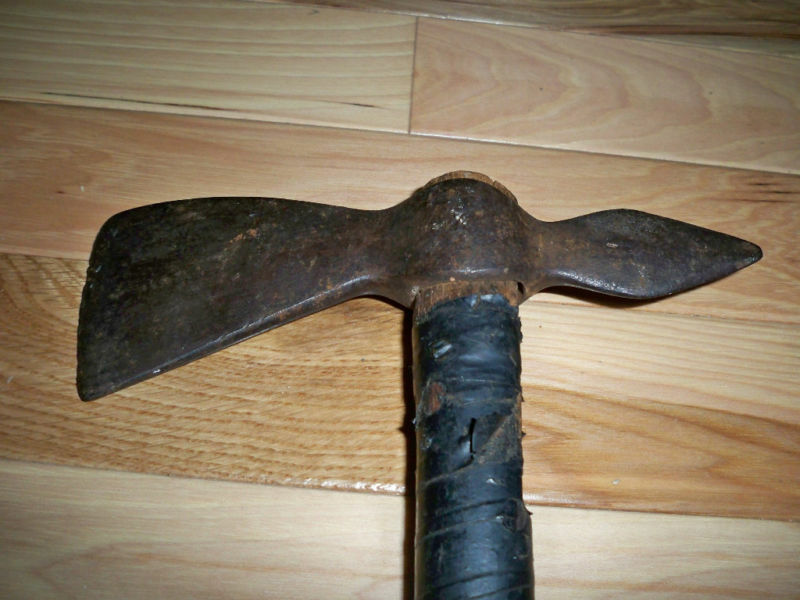 There must be hundreds of these fake Skene Foundry tomahawks (& cannon balls, spears, pikes, bayonets, etc. sold online over the last 15 years. They will then be sold at estate sales over and over again. Nobody is dumping these in a pit and burning them. This spike hatchet measuring 20" in overall length is marked 'Frick & Lindsay Co.' which was a supply company that started in 1891 and sold oil well, mill & mining supplies. 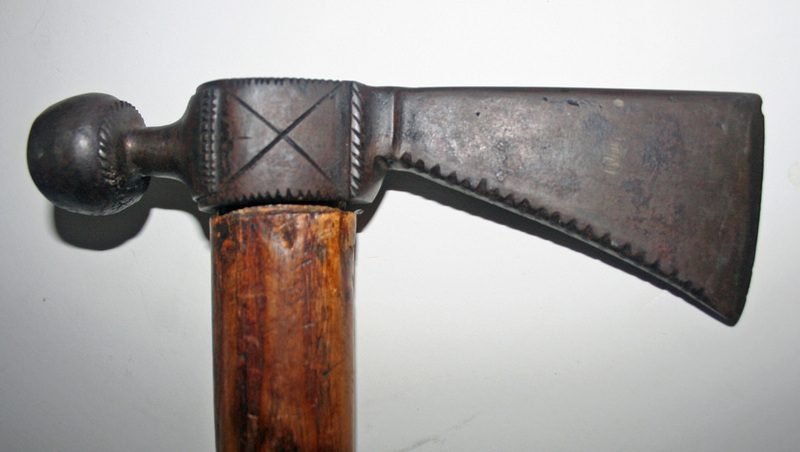 This ice chest axe is frequently misidentified as a spike tomahawk. It measures 9.5" x 1.5" & weighs 1 lb 4 oz. with a 12" long handle, so the dimensions are not too far off. However the blade length is longer than the spike--authentic spike tomahawks are more balanced. 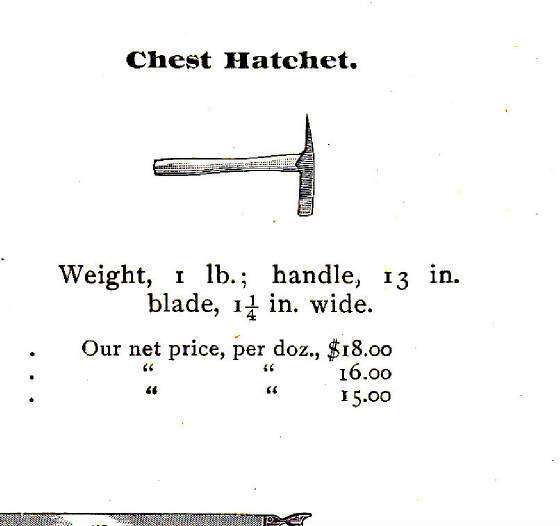 The shape & all the dimensions exactly match an old advertisement for an ice hatchet pattern called a "chest hatchet" from the 1880's. The 1 1/4" blade width given translates the proportional blade length of ~ 8.5"-9". 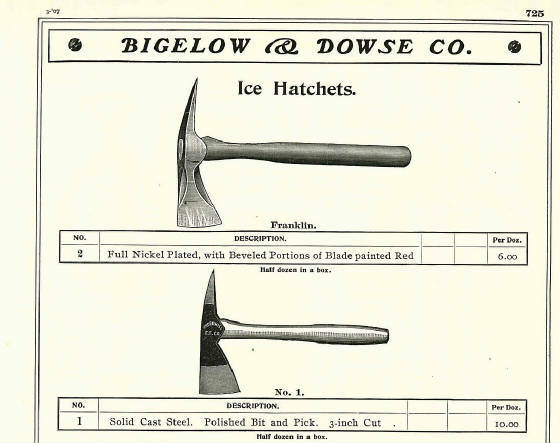 These would have been used in the home to chop ice box blocks into smaller pieces & were made by more than one company. There are similar ones that were designed as 18th C. tomahawks however their blades are never longer than the spikes -- more equidistant. The authentic spikes on those are considerably thinner, lighter and gradually curved downward. (see Swords & Blades of the American Revolution by George Neuman,pg. 268, No. 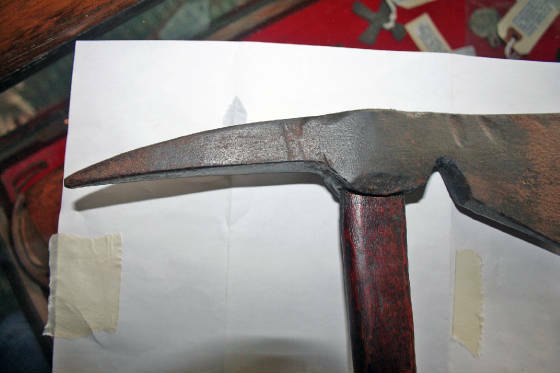 52) For more examples of this ice axe pattern see the Beatty Axe Co. version below. This example below is taken from George Neuman's 'Swords & Blades of the American Revolution'. Note the lightweight thinner profile compared to the ice chest hatchet image above. Otherwise their length & width are virtually identical. SIDE BY SIDE COMPARISON OF TOMAHAWK & ICE HATCHET. NOTICE THE BLADE IS LONGER THAN THE SPIKE IN THE BOTTOM ICE HATCHET. These spike axes are hand forged ice hatchets ~8" long made & marked by the Beatty Edged Tool Co. Most are forged with their early 20th C. name of CHESTER (for Chester, PA) along with the outline of a cow although some are marked simply "W BEATTY & SONS CAST STEEL PHILAD'A, PA." or "MINTZER & KNEISLER PHILAD'A". These came in at least two sizes & likely more avg. 1 1/4 to 1 1/2 lbs. Many of them have such faint markings stamped on a slightly convex surface & are so worn that they do not show any marking. There is no evidence I have found that they ever made spike tomahawks. ONLY ice hatchets will have the rounded blade profile--never tomahawks. Ice hatchets may have square edges also. The short story is the Hudson's Bay Company never marked their axes/tomahawks with their initials HBC or conjoined letters HB or dates, etc, etc. These are only found on fakes/repros. 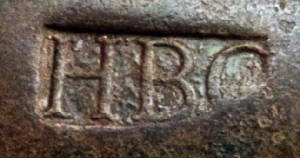 And they never used a conjoined HB on ANYTHNG they made or sold other than some trade silver, kettles & tokens (most of those in circulation are faked or repros. too). 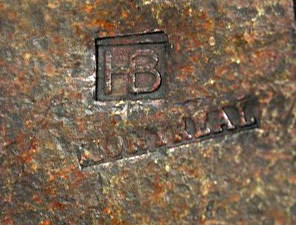 Fakers love to add phony marks such as MONTREAL or QUEBEC or NWC or dates or crowns, etc. to all kinds of fantasy 'trade' items. All of these marks should be a a huge red flag. 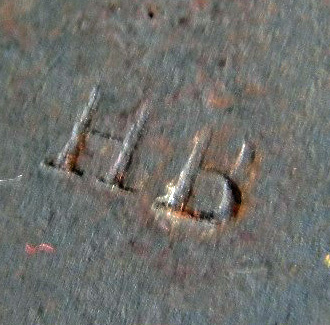 This conjoined HB mark shows up frequently on pipe tomahawks on the fake market under the claim they are Hudson's Bay Company's marks. These have been reproduced for many years and they are all fake. The irregular surface of the metal is not pitting but actually is the typical surface left by a recent forging called scaling. Scaling is usually removed by filing and polishing. Had it been authentic this mottled surface would not appear there either. This next one makes me laugh. 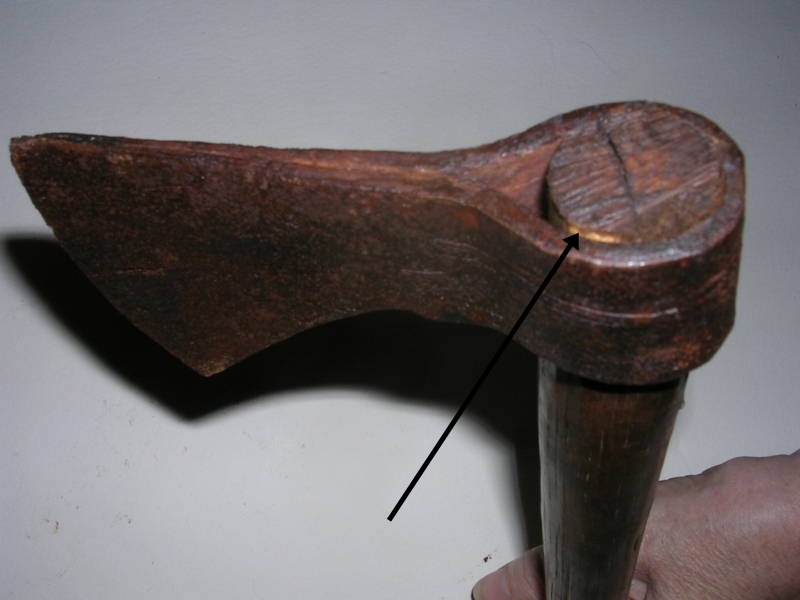 They made the mark so that the resulting mark looked worn or miss-hit, but you can clearly see it was made that way and was cast into the ordinary cast iron hatchet head it is on. This is organized crime when people are creating items mass produced for the naïve market that they prey upon. There are far to many fake marks to list here. 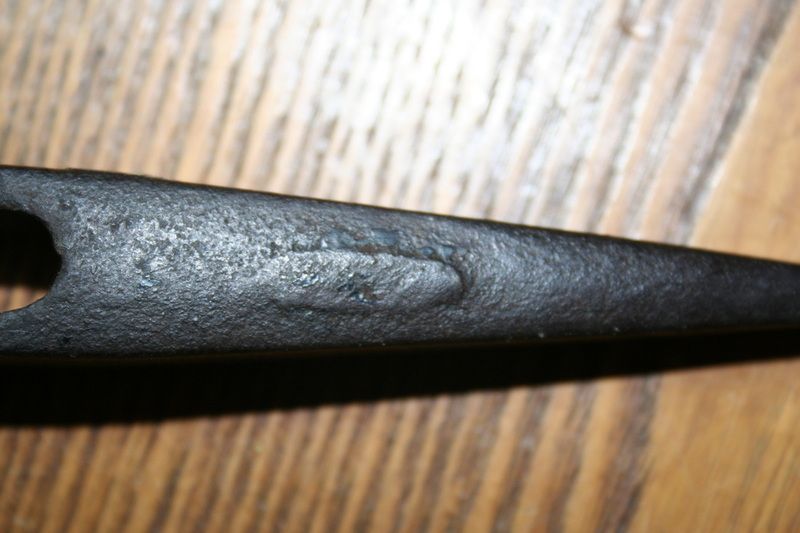 THIS MARK WAS CAST IN THE AXE ITSELF. 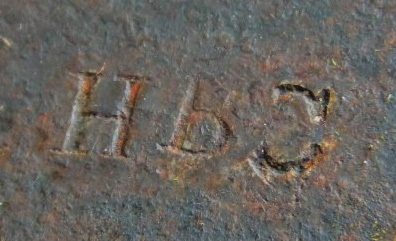 FAKE I & H SORBY MARK ON BRONZE REPRO. Is it a fire axe? Is it an ice hatchet? Roofing hatchet? It doesn't matter. You know it can't be a spike tomahawk. Why? among the obvious reasons the V-notch nail puller on it was made for round shafted nails. It wasn't until 1888 that the manufacturing process for mass producing wire for wire nails was invented. So clearly the nail puller can't be any earlier than that. Before that all the nails and nail puller notches were square for removing square nails. The head is far too heavy and style is tool-like. This spike axe is cast iron and of course spike tomahawks were NEVER made of cast Iron because of their brittleness. Cast iron works well as hand wood working planes but drop them on a cement floor and you know what I mean. 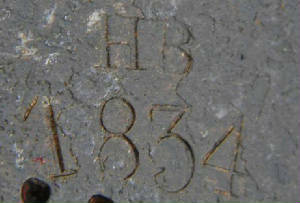 The casting seam is visible underneath and on top & the undulations were cast in to appear as hammer marks. Another example of the identical model fake is also shown. This spike tomahawk looks fairly good in the first photo. But the 2nd shows the remains of the raised casting seam down the center (not a forging seam). 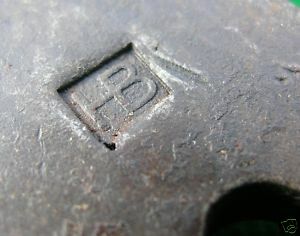 And the third photo shows on the underside the raised oval injection port where the cast iron was forced into the mold. The haft was stained with modern mahogany stain. They never made cast iron spike tomahawks during the historic era of use, they were too brittle. This would be a later circa 1940s-1960s reproduction that was sold as an original. 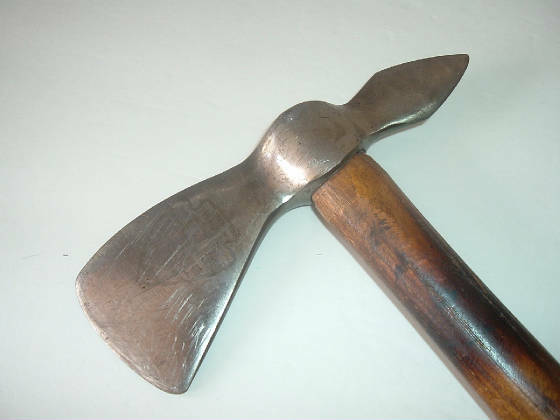 The following spike tomahawk has been reproduced by casting in molds as reenactor items. Of course they end up as authentic too. They began making these since the 1950's and still do today in various European countries and the U.S. out of cast iron and drop forged steel. I have seen them from England, Spain, Italy, Colorado, Canada, India, etc. Although there were leaf bladed spike tomahawks none are in this exact shape, are not cast & are very different. Here is one that looks old, eh? Its brand new, sand cast iron to give it that pitted look. Here is another one that shouldn't fool anyone but if you rub some dirt into the bead work --it suddenly is thought old. They never used railroad spikes to make spike tomahawks.